Exclusive Black Velvet magnetic borders to easily create a black, light-absorbing, removable border around the projection area. This border greatly heightens the contrast perception of the images on the screen. Magnetic paint need to be applied under the BaseCoat and TopCoat. 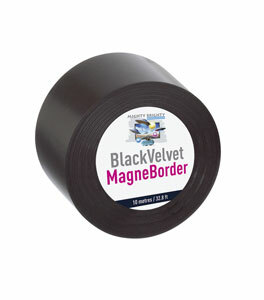 When the BLACK VELVET MagneBorder is removed, all you see is a clear white or light grey wall.